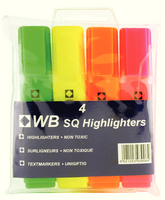 Pack of pocket highlighters. Chunky barrel for comfort grip. Strong plastic cap with pocket clip. Chisel tip for variable line width. Assorted pack of orange, green, yellow and pink. Pack of 4 pens. Approx Dimensions (CM): D12 W12 H3. Approx Weight (KG):0.0751.